According to designer Sjaak Hullekes his offering for spring/summer 2010 titled “Oscar” is all about craftsmanship, nostalgia and personality. Collars and stands were hand stitch and fine detailing was added to every piece to give each clothing a couture quality. There’s an early 60’s influence on the collection. You can feel the passion of the designer in each clothing. 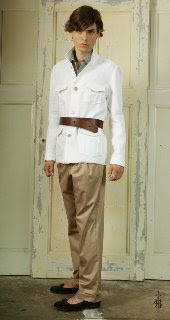 A basic round neck and V-neck-shirts is finished with french seams and hand stitched neck-bindings, and pleated trousers, has hand-stitched fly and a waistband facing that were finished at the inside by a 2cm fringed edge.